When some substances are dissolved in water, they undergo either a physical or a chemical change that yields ions in solution. These substances constitute an important class of compounds called electrolytes. Substances that do not yield ions when dissolved are called nonelectrolytes. If the physical or chemical process that generates the ions is essentially 100% efficient (all of the dissolved compound yields ions), then the substance is known as a strong electrolyte. If only a relatively small fraction of the dissolved substance undergoes the ion-producing process, it is called a weak electrolyte. Substances may be identified as strong, weak, or nonelectrolytes by measuring the electrical conductance of an aqueous solution containing the substance. To conduct electricity, a substance must contain freely mobile, charged species. Most familiar is the conduction of electricity through metallic wires, in which case the mobile, charged entities are electrons. Solutions may also conduct electricity if they contain dissolved ions, with conductivity increasing as ion concentration increases. Applying a voltage to electrodes immersed in a solution permits assessment of the relative concentration of dissolved ions, either quantitatively, by measuring the electrical current flow, or qualitatively, by observing the brightness of a light bulb included in the circuit ([link]). Solutions of nonelectrolytes such as ethanol do not contain dissolved ions and cannot conduct electricity. Solutions of electrolytes contain ions that permit the passage of electricity. The conductivity of an electrolyte solution is related to the strength of the electrolyte. Water and other polar molecules are attracted to ions, as shown in [link]. The electrostatic attraction between an ion and a molecule with a dipole is called an ion-dipole attraction. These attractions play an important role in the dissolution of ionic compounds in water. As potassium chloride (KCl) dissolves in water, the ions are hydrated. 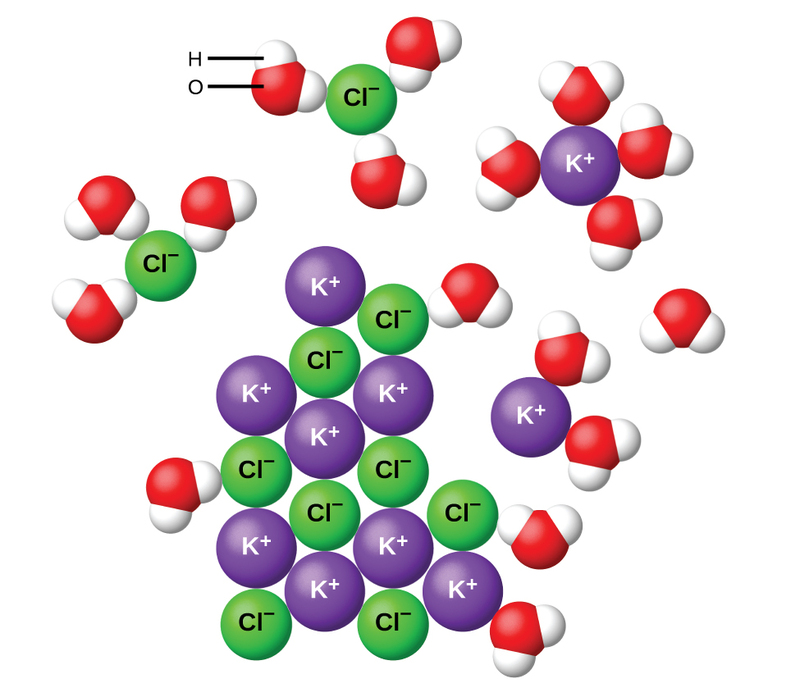 The polar water molecules are attracted by the charges on the K+ and Cl− ions. Water molecules in front of and behind the ions are not shown. Let us consider what happens at the microscopic level when we add solid KCl to water. Ion-dipole forces attract the positive (hydrogen) end of the polar water molecules to the negative chloride ions at the surface of the solid, and they attract the negative (oxygen) ends to the positive potassium ions. The water molecules penetrate between individual K+ and Cl− ions and surround them, reducing the strong interionic forces that bind the ions together and letting them move off into solution as solvated ions, as [link] shows. The reduction of the electrostatic attraction permits the independent motion of each hydrated ion in a dilute solution, resulting in an increase in the disorder of the system as the ions change from their fixed and ordered positions in the crystal to mobile and much more disordered states in solution. This increased disorder is responsible for the dissolution of many ionic compounds, including KCl, which dissolve with absorption of heat. In other cases, the electrostatic attractions between the ions in a crystal are so large, or the ion-dipole attractive forces between the ions and water molecules are so weak, that the increase in disorder cannot compensate for the energy required to separate the ions, and the crystal is insoluble. Such is the case for compounds such as calcium carbonate (limestone), calcium phosphate (the inorganic component of bone), and iron oxide (rust). Pure water is an extremely poor conductor of electricity because it is only very slightly ionized—only about two out of every 1 billion molecules ionize at 25 °C. Water ionizes when one molecule of water gives up a proton to another molecule of water, yielding hydronium and hydroxide ions. In some cases, we find that solutions prepared from covalent compounds conduct electricity because the solute molecules react chemically with the solvent to produce ions. For example, pure hydrogen chloride is a gas consisting of covalent HCl molecules. This gas contains no ions. However, when we dissolve hydrogen chloride in water, we find that the solution is a very good conductor. The water molecules play an essential part in forming ions: Solutions of hydrogen chloride in many other solvents, such as benzene, do not conduct electricity and do not contain ions. This reaction is essentially 100% complete for HCl (i.e., it is a strong acid and, consequently, a strong electrolyte). Likewise, weak acids and bases that only react partially generate relatively low concentrations of ions when dissolved in water and are classified as weak electrolytes. The reader may wish to review the discussion of strong and weak acids provided in the earlier chapter of this text on reaction classes and stoichiometry. Substances that dissolve in water to yield ions are called electrolytes. Electrolytes may be covalent compounds that chemically react with water to produce ions (for example, acids and bases), or they may be ionic compounds that dissociate to yield their constituent cations and anions, when dissolved. Dissolution of an ionic compound is facilitated by ion-dipole attractions between the ions of the compound and the polar water molecules. Soluble ionic substances and strong acids ionize completely and are strong electrolytes, while weak acids and bases ionize to only a small extent and are weak electrolytes. Nonelectrolytes are substances that do not produce ions when dissolved in water. Explain why the ions Na+ and Cl− are strongly solvated in water but not in hexane, a solvent composed of nonpolar molecules. Crystals of NaCl dissolve in water, a polar liquid with a very large dipole moment, and the individual ions become strongly solvated. Hexane is a nonpolar liquid with a dipole moment of zero and, therefore, does not significantly interact with the ions of the NaCl crystals. Explain why solutions of HBr in benzene (a nonpolar solvent) are nonconductive, while solutions in water (a polar solvent) are conductive. (a) Which of the following sketches best represents the ions in a solution of Fe(NO3)3(aq)? (b) Write a balanced chemical equation showing the products of the dissolution of Fe(NO3)3. Compare the processes that occur when methanol (CH3OH), hydrogen chloride (HCl), and sodium hydroxide (NaOH) dissolve in water. Write equations and prepare sketches showing the form in which each of these compounds is present in its respective solution. What is the expected electrical conductivity of the following solutions? Why are most solid ionic compounds electrically nonconductive, whereas aqueous solutions of ionic compounds are good conductors? Would you expect a liquid (molten) ionic compound to be electrically conductive or nonconductive? Explain. Electrolytes by OpenStaxCollege is licensed under a Creative Commons Attribution 4.0 International License, except where otherwise noted.